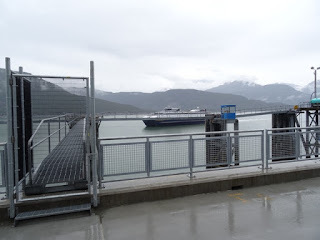 We arrived in Haines before 9:00 AM and as I mentioned on my last blog our arrival in Haines had a bumpy beginning as the Fast Ferry from Skagway didn’t stop before it got to the dock. It hit hard and broke up a few of the dock boards. The good thing was that our ride to the hotel was there and waiting for us. We had originally reserved a car through Avis but then discovered our hotel (Captain’s Choice) also rented cars a lot less than Avis charged. That sounded like a good deal since we’ve discovered much of what you buy or money you spend is not what you’d call a good deal in this area of Alaska. This was our first experience renting a car from someone other than Hertz or Avis,. We got a few chuckles out of that one but we did save about $60. We also took quite a few pictures of the dents and broken glass so we wouldn't be blamed for it. Would we do it again? Certainly! We loved the view from our room and were pleased with our choice of accommodations here. The first thing on our agenda though was heading out to Chilkoot Lake. Staff at the hotel assured us there were lots of bear to be seen there. We should have known better but we’re slow learners I guess. Anyway, it was a short distance and we were off. It was a beautiful drive along the river and down to the lake. There were a few cars but not many and there were absolutely no cruise ship tour buses. We didn’t see a single bear or a single eagle on our way out. I have to admit we were quite disappointed with that. The river would be amazing though during salmon runs. We could just imagine it packed with bears feeding on the salmon. What a sight that would be but, as usual, our timing was out of whack. The largest accumulation of eagles in North America is in Haines but they don’t accumulate until much later in the year. Up to 5,000 of them have shown up in the past with about 350 eagles hanging around all year round. They even have an eagle festival here. We were still sure we’d see plenty of eagles if we visited the Lake Chilkat Bald Eagle Preserve. So we drove the 19 miles to the preserve. I thought 350 local eagles was still a good number but it wasn’t necessarily good enough to see any where they were supposed to hang out. I’m thinking they didn’t know. However, we did see a mama moose and her baby! Now that was exciting!! When I first saw the moose it was so big I thought it was a horse but it didn’t take a second longer to realize it wasn’t. What in a world would a horse be doing there anyway? The baby moose was running from the cars and the mommy moose was watching. After the moose headed back into the woods, we decided to make one more trip out to Lake Chilkoot. 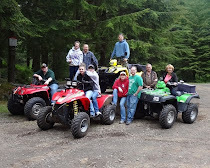 It was only a five mile journey from town and we just had to give one more try to hunting the bears. It was a beautiful drive, it was still early and so why not? Again, we were out of luck with the bears but check out this totem pole and the beauty of the area. We did see several eagles this time. They were in different locations close to the lake and the river so that made it all worth while. In one area we saw two adults with two juvenile eagles. We stayed quite a while and enjoyed watching them. Back in town we had dinner down by the marina. It was another good day as we had seen lots of eagles and a moose. All we were missing was that bear. The following morning more clouds had returned with rain threatening. It was a short shuttle to the ferry and we were looking forward to another ride down the Alaska Marine Highway. Our first stop would put us back in Juneau. 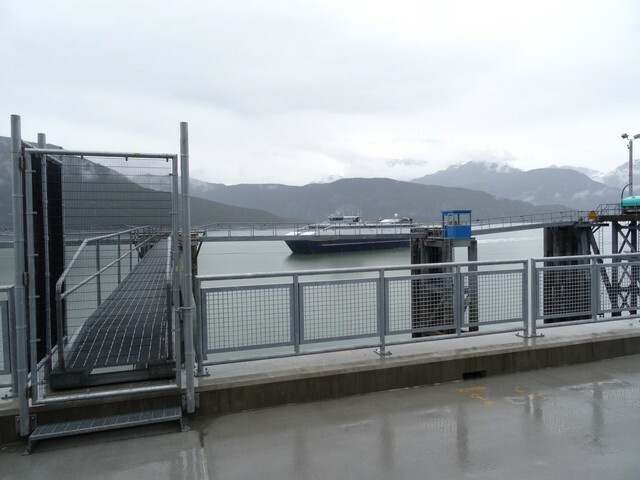 There we would transfer to a different ferry for a continuation as we headed south towards Ketchikan. We love the ferries in Alaska and here comes the next one.. Previous blog Leaving Skagway for Haines is here. It is an amazingly wild place! We will have to go back someday. It is so exciting to see wildlife. And a baby moose - how great is that. Your last eagle picture is spectacular as is the scenery. Sorry about the illusive bears. We have only seen one and it was running away. Hope we don't have as many this August as last year. Eagles are a regular occurrence here, fighting with the osprey. Guess you will have to go to Yellowstone to see bear...lol. Love the view from your room, spectacular! To much fun there, don't ever get between a Mama Moose and her baby, happened to us once in Ontario, and she wanted to take out our car that we were in, now that was an exciting experience. Oh my gosh...what gorgeous scenery. You two are sure having an amazing adventure. I love the totem pole with the awesome mountains behind. Beautiful photos. The eagles are crazy good! It's nice that there aren't a cruise ships around. Super picture of that bald eagle. I think you had the eagle eye to spot it! I'm thinking I would really love traveling by ferry up there - it seems the brilliant way to travel :-) While eagles and bears are amazing, I most want to see a moose! And you saw a baby too - love it.